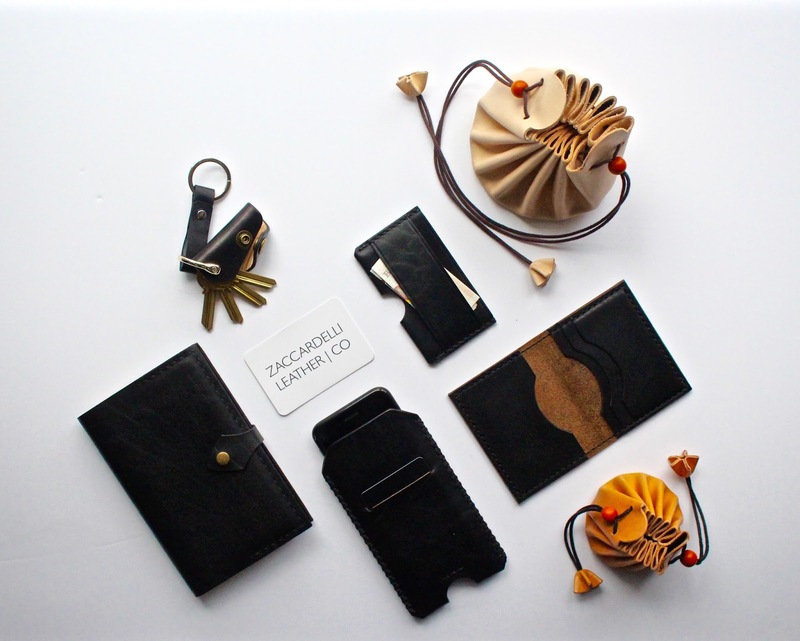 This week we have been lucky enough to talk to the amazing team behind Zaccardelli Leather Co, and Edinburgh based luxury leather goods brand. This gorgeous handmade leather goods company combines beautiful design with the highest quality materials to create a stunning collection of chic leather products. The team is made up of father/son team Sergio and Jordan along with creative director Daria. Between the three of them, they have created the most amazing minimalist brand that we couldn't recommend for a beautiful gift that will last a lifetime. The three of us are always struggling to buy for the men in our lives and now we can't wait to get our orders and treat the guys to a one-off beautiful leather piece - and maybe grab something for ourselves too! What is the story behind Zaccardelli Leather Co? Zaccardelli Leather Co was founded with the inspiration to become the finest producers of authentically crafted handmade leather goods in Scotland. When Zaccardelli Leather was founded, there weren't any producers or manufacturers that could produce our designs that satisfied my father and I expectations. 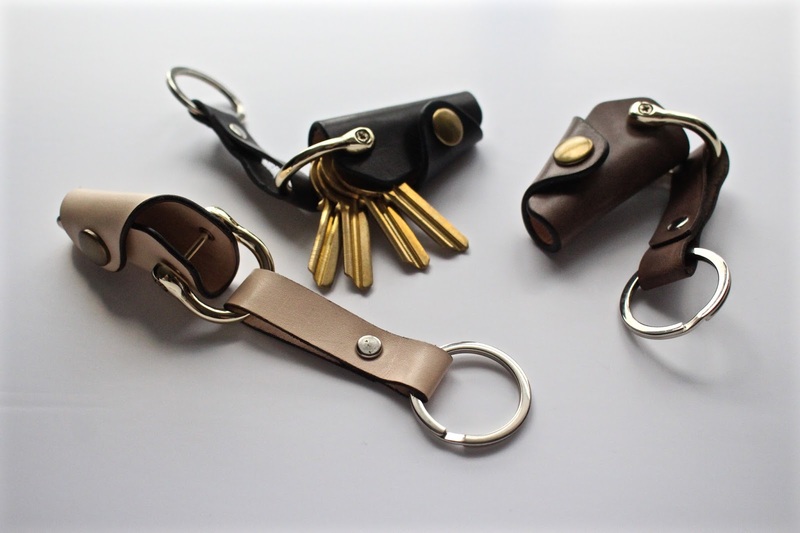 All the leather handmade accessories that were available at the time were mass produced, low quality and had no originality that we expected from a high-priced high-end leather product. We set ourselves a goal to design and produce products that we would use ourselves at an optimal price whilst also maintaining quality to our standards. We source our materials from predominately local suppliers and do not purchase anything outside of the United Kingdom with the exception of Italy, as we are both of Italian heritage. We love that your brand is a father/son operation. What's it like working so closely together? We have a good working relationship as we both have the same goals and ideas on design and development. You can't break the bond between family. Business comes second nature to us, all generations before us have had their hands in large businesses and have been extremely successful so business runs in the blood. Our photographer Daria has been a good addition to the team as she has brought her own ideas into the mix through her photography work from the fashion scene. As Sergio (my father) is responsible for the production and design, his inspirations come from a background of design and craft notably from woodwork and luxury paint effects. In essence, we are from a creative and hands-on family that have a history of entrepreneurship and family-run businesses. We are creative people that are inspired by everything around us. Are you driven by trends within fashion when producing products? We are driven by practicality and minimal design. We aim for our products to be timeless despite the change in trends however still remain inspired from the latest campaigns from the likes of Luis Vuitton, Bottega Veneta and Armani. Who would you say your target customer is? 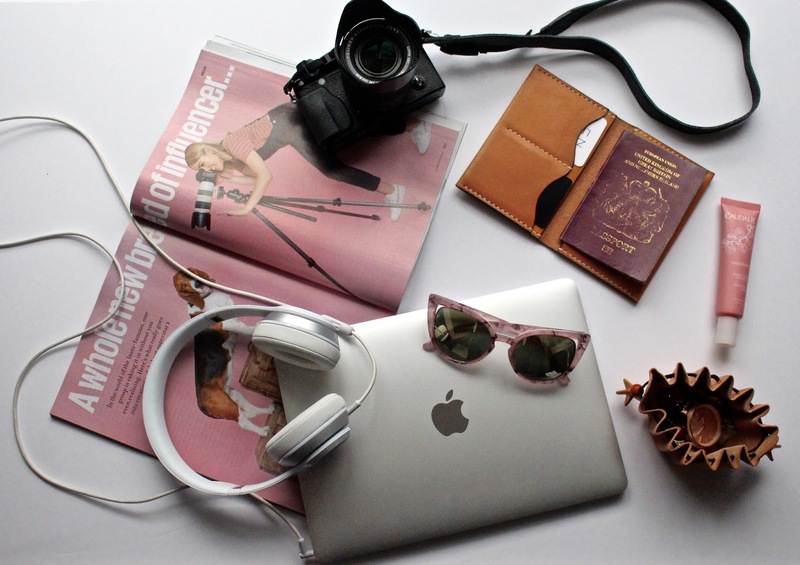 We have tried to develop products we feel will be apt to a wide audience, for instance, if you look at our Apple range this been specifically marketed to students and young professionals who are carrying around their mac and also an iPhone that they have invested a lot of money into. Our cases are mid-range priced and high-end finished to allow students to have a little style with protection whilst also having the knowledge that these products are not generic and have been handmade. Secondly, we have developed products for men and women. Our drawstring bag and journal are typically our most popular selling items with a wide age range purchasing these. We have tried to break down the market to target as many segments as possible who are attracted to our ethos. Our products are timeless so this opens up possibilities for everyone to find something they like. We love your stark, simple and chic photography. Where did the inspiration for that aesthetic come from? Our inspirations come from our ability to continuously look through lifestyle magazines, stalking Instagram, Pinterest and big-name campaigns online. We all have a particular love for minimalism and that forms the basis of our photography work and our own campaigns. We also have a love for locations shooting, Edinburgh and Scotland are perfect for what we need. What are your favourite products from the collection? 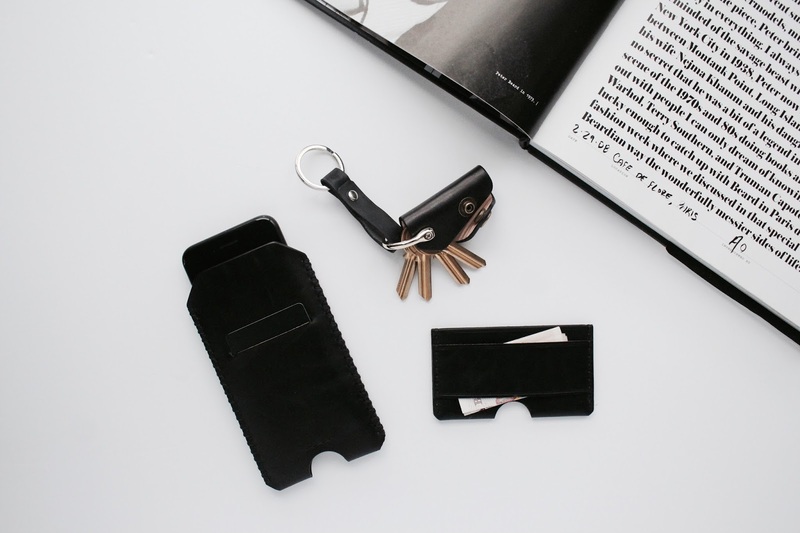 My favourite product is our Revolution Key Holder. Personally, I think its the perfect well designed accessory as I can not stand having a messy load of keys rattling around my pocket damaging my phone. Everything is in one place and organised. The Minimalist Card Holder is my favourite product for its smart, slim design and its usability. I can carry it in any of my pockets and also place it in a clutch bag without out the need for a bulky purse. I can also put my cash on the reverse side without worrying. 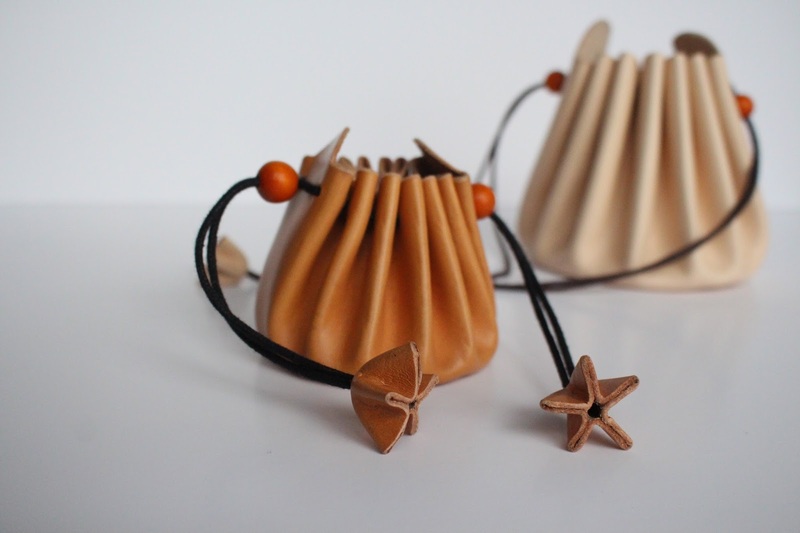 The drawstring was the first product I designed which was inspired from a bag I bought in Greece. I didn't like the way the bag was designed so I re-designed and developed our Drawstring Bag as I didn't like carrying loose change anywhere. My wife uses our drawstring bag for storing her jewellery and to travel with. I love it as it has so many practical purposes. Who are some of your favourite designers? I have a particular attraction to minimalism, and there is no-one better than Giorgio Armani for me. He encompasses elegance, timeless design and produces the essentials to a luxury lifestyle. Burberry is another of my favourite designers as I love how they have developed a trademark pattern that they have managed to roll out on all of their products. Christian Lacroix Couture, for his artistic and over the top flavorous style. My favourite designer would be Valentino for his embodiment of the classic, elegant beauty. Prada would be my favourite designer. I love their stark design and that they consistently produce sought-after products whilst always maintaining high standards and quality with unique designs. What are your plans for the future of Zaccardelli Leather? Currently, our efforts are going into the frenzy of Christmas. After Christmas, we are going to focus on collaborations with other brands to open up our designs and aesthetics with brands we feel compliment our products. We are also going to focus on getting ready for our first push on entering the retail world with exclusive stockists and also high-street stores. We have been relatively successful with independent retailers and will also roll out to other parts of the country through independent retailers in London and wider England with the end goal being our own store and adjacent workshop along with a large E-Commerce web presence. How would you describe your brand is one word? I can describe it in three words which are the essence of the brand.